You must be wondering how come western India recipes on my blog...well I am raised in Kalyan and much acquainted to Maharashtrian food. Since my childhood I used to trade my lunch box whenever my friend used to bring this in her lunch box. 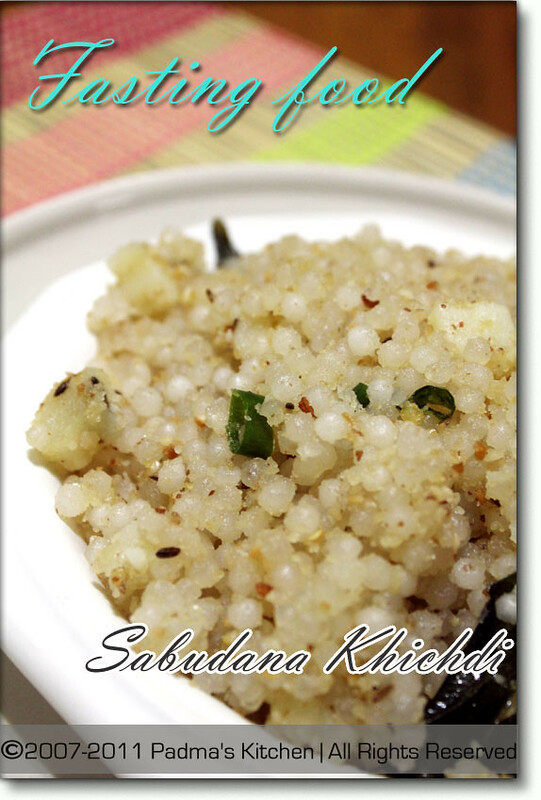 Sabudana khichdi is my favorite breakfast recipe, I love so much that I can eat 4 times a day! This is a typical Maharashtrian style khichdi I learned from our kaki (maid), she makes awesome khichdi!! 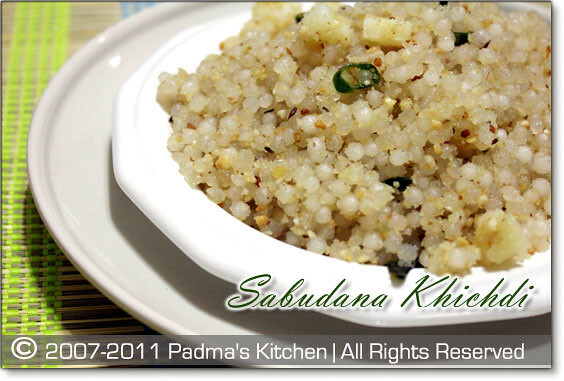 Sabudana Khichdi is also famously called a fasting food during the ekadashi days, or sankashti chaturthi days when most of the maharashtrians fast. You will find in on the menu of many mess/canteens in most of Mumbai and surrounding when there is this special fasting done. But I love it any time any day. I make it as Naivedyam or Prasad to offer to Saibaba on Thursdays or for Saibaba Satsangs. After much talking here goes the recipe. Soak sabudana 6-7 hours before hand. First wash and rinse the sabudana and then soak them in enough water that all of it is submerged in the water. Next, roast peanuts in microwave. Place them on microwave safe plate and heat it on high for 3 or 4 mins. You will see that the peanuts are turned slightly brown, let it cool and remove the skin and grind into powder. alternatively you can dry roast them in a pan, if m/w is not the option. Chop potato into medium size and medium size and place then in a microwave safe bowl, pour some water and heat it for 5 mins high. alternatively you can fry the potatoes in the oil itself, will take little while till they turn crispy. Heat oil in kadai or non-stick pan on medium high, add curry leaves/kadipatta, crushed jeera and green chillies, let them fry for 1 min and then add the boiled aloo. Reduce the flame to medium low and let the potatoes turn crispy golden brown. Add the sabudana, mix well, for a minute so that everything is mixed well. 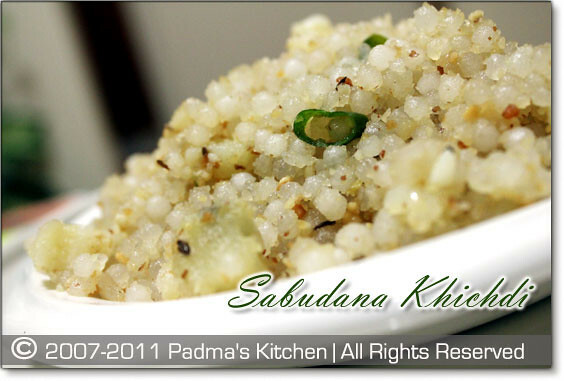 Sprinkle salt, close with a lid and let it cook for 10 mins... keep in mind to reduce the flame to simmer (low), after 8-10 mins check the khichdi and see if there are any hard white sabudana left, coz by now you sabudana will turn into transparent soft pearls. Check for salt and lastly add peanut powder, mix well and let it cook for another minute. Close the lid and remove from stove. See that you raw sabudana is not crushed or has lot of powdered sago in it.. If that is the case then just sift the sago so that all the powder is out and on whole sago is to be used. Soak it in enough water to cover the sabudana, do not add more water, or else you will end up with a mushy khichdi. So the rule of thumb is just enough water so that all the sago is submerged in it. Use a little bit extra oil to get that tasty khichdi...common once in a while its ok to have an extra tablespoon or so... so why compromise on the flavor. You can use more peanut powder than listed in the above menu...more taste you see!! 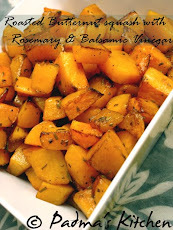 Changed my blog from cinnamomtrail to cooklikemom, and started posting again. Hope I will have fun cooking and posting once again. this looks very DELICIOUS! Love this khicdi and look forward to eating it every time I visit my sister in Pune! And this would be a breakfast idea, very interesting. Perfect recipe for fasting. Thanks for the recipe.